Giving a chess set as a gift may seem like a strange suggestion at first. I know what you’re probably thinking. How boring – a chess set. 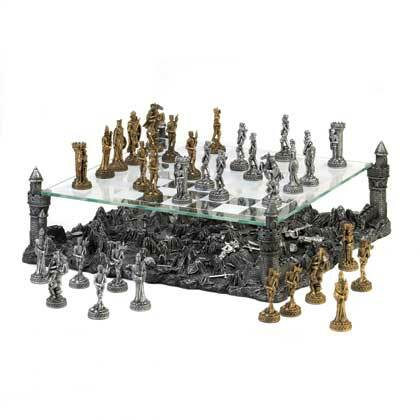 Who would want to receive a chess set as a gift? I use to feel the same way until a friend suggested that I buy one for my nephew. After doing a little research on chess, I was sold on the idea. I discovered that a chess set can be the perfect gift for just about anyone. So why is a chess set the perfect gift for just about anyone? Do you know a student that struggles in reading or math? The real problem may not be the subject. It could very well be that the content is masking the real problem – they lack higher-order thinking, analytical, and decision-making skills. Many students struggle to master these required skills. Chess gives students the opportunity to develop these skills and have fun at the same time. To be quite honest, whether the recipient of the gift is a student, a housewife, or a professional, they can benefit from increased creativity, improved memory, and better decision-making skills. Everyone suffers from stress at some point in their life – no matter their age. Life puts demands on us that are overwhelming which causes us to experience stress. Some people may also experience anxiety or depression. According to the National Institute of Mental Health, 40 million American adults are affected by anxiety disorders, and 14.8 million American adults are affected by major depressive disorder each year. In my research, I discovered that chess has tremendous mental health benefits. It is a form of psychotherapy and is often used in recreational therapy. Noted benefits include a reduction in stress and greater self-esteem. Chess has also been known to fight depression and anxiety. Who doesn’t want to improve their relationships? What better way to improve relationships than spending quality time together. Playing board games such as chess increases face-to-face time. Because there are only two players involved, it is a great way for two people to give each other alone time. And, parents can use this time to give their children individual attention. Interaction between players during games leads to a relaxed atmosphere and better communication. Men, women, boys, and girls love chess because it is both fun and competitive. After researching the game of chess and its many benefits, I decided to learn to play the game myself. Although I am just a beginner, I already see the benefits. I will be forever grateful to my friend who suggested I buy a chess set for my nephew. If you’re ever in search of a gift that anyone can enjoy, buy a chess set. The recipient of the gift will thank you for it.